WBC Super Flyweight World Champion Srisaket Sor Rungvisai (46-4-1, 41 KO's) of Thailand needed less than 3 minutes to punish and destroy 38 year-old Korean Young Gil Bae (28-7-2, 22 KO's) today Saturday (July 21) at Workpoint Studios in Bangkok, Kingdom of Thailand. The coming-forward Thai world Champion (tormentor of Nicaraguan 4-division world champion Roman "Chocolatito" Gonzalez), harassed his prey from the get-go landing vicious right overheads and left hooks that quickly, badly affected the Korean fighter who was unable to land a single punch on the popular Thai star. 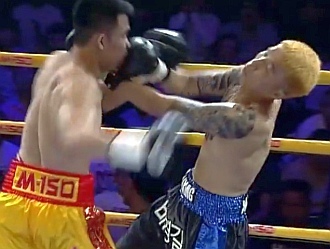 Sor Rungvisai's next combat will be the third defense of his world title October 6 at the Impact Arena in Thailand; and some fans wonder how would be a clash of Sor Rungvisai against Donnie Nietes or Jerwin Ancajas. The promoter of the fight was Surachart Phisitvuthinun.